Vagylagos, két- vagy többféle választás több lehetõség közül. Valamely mûfaj azon ága, amely több tulajdonságában eltér a tradicionálistól (pl. alternatív rap). A hivatásos és az amatõr együttesek, társulatok között elhelyezkedõ harmadik, "félhivatásos" csoport. Az Amerikában használt alternatív zene kifejezés angliai megfelelõje az "indie". There’s something about being in the crowd at the start of an alternative music concert. There’s a tremendous excitement that comes from hearing that first guitar chord echo through the venue. Soon, the chord turns into a riff and that riff into a groove. Before you know it, your head is rocking back and forth and your foot is tapping. The music is in full swing and you’re enjoying your favorite alternative band in concert. This memorable moment was made possible because you purchased your alternative music tickets from Clickitticket. Our selection is the largest on the internet and it’s always being updated. Not only that, but our transactions are one-hundred percent safe and secure. In the above paragraph, our alternative music concert began with the strumming of a guitar. While most alternative bands/artists rely on that instrument, the term is so ambiguous that it’s also used to describe electronic bands. The term “alternative music” was first used in 1979 but didn’t become popular until the 1990s. Over the years a number of bands/artists have been categorized as “alternative” including The Talking Heads, The Police, The Cars, Peter Gabriel, Depeche Mode, and U2. 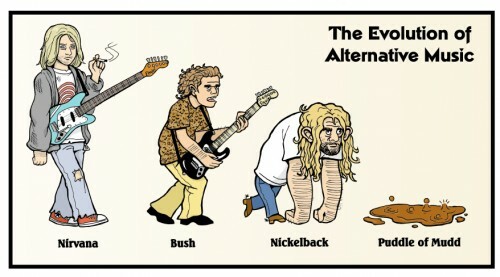 “Alternative” refers to an “alternative to Top 40 music” or an “alternative to rock music.” Generally, alternative is guitar-based music that’s built on good songwriting. Other characteristics of alternative music are unique instrumentation, politically charged lyrics, and a dark or dour mood. As for an alternative music concert, you’re far more likely to experience a straight-ahead performance with no bells or whistles than you are to find an elaborate stage and professional choreography. To get a better understanding of the genre let’s look at playlists of alternative radio stations, both terrestrial and satellite. Alternative radio stations usually spin songs from a wide range of acts. That includes hard rock bands like Tool, Staind, and Korn; country-fused acts like Old 97s, Zac Brown Band, and Cowboy Junkies; pop punk outfits like Fall Out Boy, Plain White T’s, and Paramore; singer-songwriters like Aimee Mann, Ben Harper, and Suzanne Vega; and big name artists like Dave Matthews Band, Radiohead, Pearl Jam, and Nine Inch Nails. On top of all that, alternative music also encompasses the subgenres of punk, post-punk, pop punk, New Wave, grunge, EDM, and sometimes even reggae. Of course, there are some bands that are quintessentially alternative. These bands include The Black Keys, Arctic Monkeys, Arcade Fire, Kings of Leon, and Weezer.